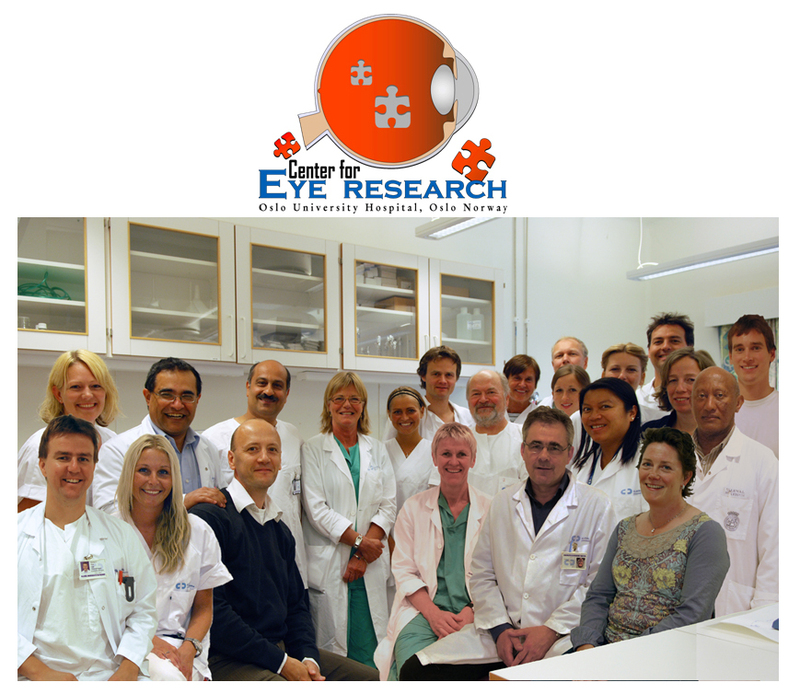 Center for Eye Research, University of Oslo, is located at Dep.of Ophthalmology at Oslo University Hospital. Professor Bjørn Nicolaissen is head of the Center. We have wide experience in tissue- and cell culture procedures, as well as a range of analytical procedures including ultrastructural- (electron microscopy), immunohistochemical-, and molecular biological- analyses. Presently, our clinic has the only Program in Scandinavia, for transplantation of ex vivo generated ocular tissue for anterior segment surgery, including autologous transplantation of limbal stem cells performed by Professor Liv Drolsum and conjunctival tissue performed by consultant oculoplastic surgeon Dag Krohn-Hansen. Associate Professor Morten C. Moe and Senior Scientist Aboulghassem Shahdadfar is heading the translational research projects at the Center, where isolation and characterization of stem cells from the adult human eye is one of the main strategic research focuses. There are currently 7 PhD students at the Center. Ofthalmologica del Mediterraneo, Research Unit, Valencia, Spain. Westerlund U, Moe MC, Varghese M, Berg-Johnsen J, Ohlsson M, Langmoen IA, Svensson S.. Stem Cells Harvested from the Adult Human Brain Develop into Functional Neurons. Exp Cell Res. 2003 Oct 1;289(2):378-83. Moe MC, Westerlund U, Varghese M, Berg-Johnsen J, Langmoen IA, Svensson M. Development of neuronal networks from single stem cells harvested from the adult human brain. NEUROSURGERY. 2005 Jun;56(6): 1182-8. Moe MC, Varghese M, Westerlund U, Ramm-Pettersen J, Danilov AI, Brundin L, Svensson M, Berg-Johnsen J and Langmoen IA. Multipotent progenitor cells from the adult human brain: Neurophysiological differentiation to mature neurons. BRAIN 2005 Sep;128(Pt 9):2189-99. Covacu R, Danilov AI, Rasmussen BS, Hallen K, Moe MC, Lobell A, Johansson CB, Svensson MA, Olsson T, Brundin L. Nitric Oxide Exposure Diverts Neural Stem Cell Fate from Neurogenesis towards Astrogliogenesis. Stem Cells. 2006 Dec; 24(12):2792-800. Varghese M, Olstorn H , Sandberg C, Vik-Mo EO, Noordhuis P, Nister M, Berg-Johnsen J , Moe MC, Langmoen IA. A Comparison between Stem Cells from the Adult Human Brain and Brain Tumors. NEUROSURGERY, Neurosurgery. 2008 Dec; 63(6):1022-33. Moe MC, Froen RC, Sandberg C, Vik-Mo E, Olstorn H, Langmoen IA, Nicolaissen B. A comparison of epithelial and neural properties in progenitor cells derived from the adult human ciliary body and brain. Experimental Eye Research, 2009 Jan;88(1):30-8. Fodor M, Petrovski G, Moe MC, Németh G, Dinya Z, Tormai I, Bíró Z, Újvári T, Berta A and Facskó A. Spectrographic study of explanted opacified and originally packed hydrophilic acrylic intraocular lenses. Acta Ophthalmologica, 2010 May 19. Petrovski G, Berényi E, Moe MC, Vajas A, Fésüs L, Facsko A and Berta A. Clearance of dying ARPE-19 cells by professional and non-professional phagocytes in vitro - implications for age-related macular degeneration (AMD). Acta Ophthalmol. 2010 Nov 23. Frøen R, Johnsen EO, Nicolaissen B, Berenyi E, Berta A, Petrovski G and Moe MC. Isolation of neuroepithelial progenitor cells from human peripheral iridectomies. Submitted.